I recently read H.P. Lovecraft's "The Colour Out of Space" (which HPL regarded as his best story, and was certainly the best pure alien story I've ever read) for the first time since high school, and what's been percolating about in my head ever since was the way the eponymous Colour in the story physically taints the things around it. 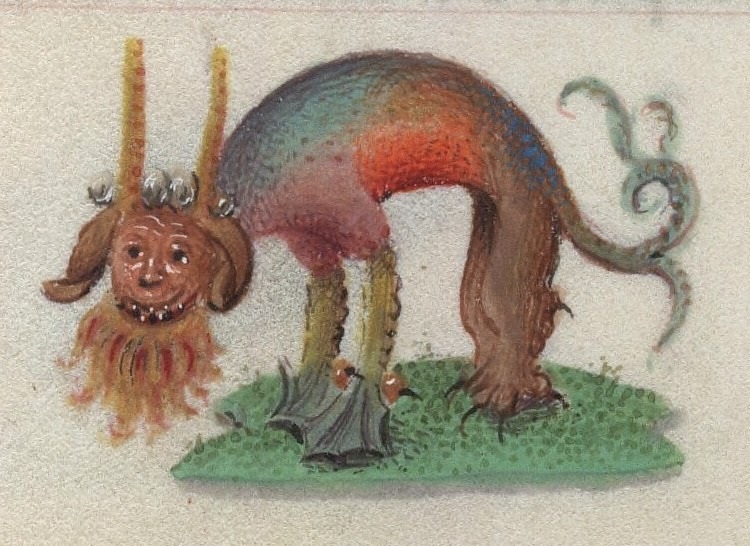 And it happened yesterday that Rafael Chandler posted on his G+ stream yesterday a selection of rainbow-coloured beasts from a medieval monk's book of hours. Naturally, things began to coalesce. These rainbow monstrosities are the result of contact with an otherworldly ooze, which is normally semi-invisible (its actual coloration is not visible to the naked eye) but when a light source such as a lantern or object with light cast on it is shined directly at it, generates a sickly, unnatural rainbow of colors. Any living creature coming into contact with this ooze must save versus poison or become one step tainted. Note that these abilities may be accrued multiple times. Each level of taint causes the subject to move one step toward Chaotic / Chaotic Neutral alignment, and requires a saving throw versus spells once per week or the subject goes irrevocably insane. One Cure Disease spell is required to remove an individual taint. 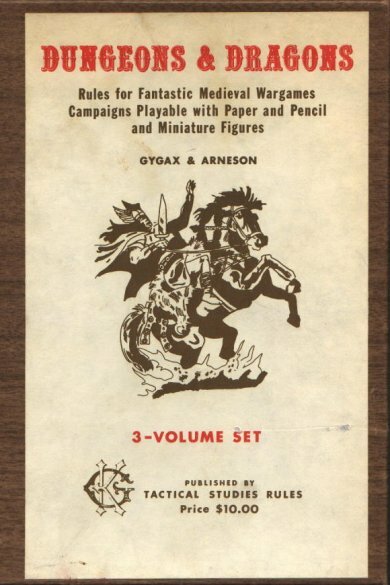 Today marks the 40th anniversary of the original release of Dungeons & Dragons. That's a pretty momentous milestone for a game that has had such a tremendous impact on fantasy, gaming and the imagination. If you haven't watched Jon Peterson's A History of D&D in 12 Treasures yet, you owe it to yourself to watch it today. His blog post details the things he shows in the video, including what he is calling the "Mornard fragments," recently uncovered copies of the pre-publication D&D rules that Mike Mornard took from Lake Geneva to Minneapolis. They seem to put to rest a lot of the textual questions floating around. It's also amazing to consider that D&D leapt like fire from a wizard's fingertips once it was exposed to actual people. Within 5 years, you had such a wealth of material and diversity that one game no longer held it all, and D&D itself had given way to AD&D. That box, with its three little brown booklets, in its way contained a kind of magic. It let a genie out of the bottle, and what way hasn't that genie gone since? Novels, video games, movies would not be the same if D&D hadn't blazed its trail. The RPG industry wouldn't exist, and I doubt whether you'd have several of the most popular miniatures or trading card games today without it. A tremendous impact for a game about exploring ancient ruins. What we do as gamers and fantasy geeks today owes a tremendous amount to the guys who played their games and hand-assembled boxes in a basement 40 years ago. It's worth taking a moment to reflect on it, and if you can't play, to at least roll a 20-sider (preferably one numbered 0-9 twice). A Clockwork Goldfish: Introduction, and why call your blog that? Introduction, and why call your blog that? Paying for Safe Passage; or, Banditry and Barons.